In fact, Wireshark creates a dumpcap process and passes it the parameters for the capture. 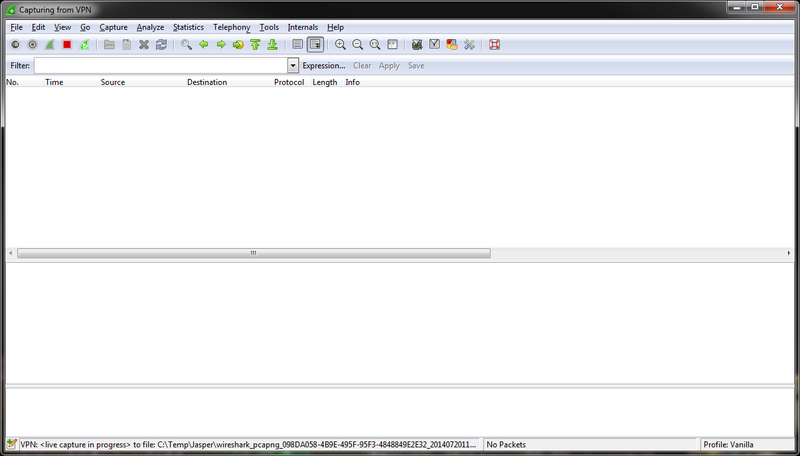 As soon as the capture is running, dumpcap informs Wireshark whenever there are new packets written to the file. That way Wireshark knows when to re-read the file to display the current list of packets. I already wrote an article about using dumpcap to avoid memory problems here. Some may argue that there is a buffer setting in the capture settings, so it must be possible to capture to memory, right? Yes, you can increase that from the default 1 or 2 mebibytes (mebibytes still sounds really strange to me, but anyway), but this will only delay the writing process. If you increase the buffer to huge numbers the incoming packets are written as soon as the buffer fills, so Wireshark will see them later – because they are only read from disk after they have been dumped from memory. This also has the funny effect that when you stop the capture you’ll still see tons of packets coming in (sometimes for minutes, depending on your buffer size), because dumpcap is still writing them from buffer and Wireshark keeps reading the new arrivals. I always keep my buffer settings set to default, to avoid trouble like that. So unless you specify a distinct file name and path when starting the capture your packets will be written to whatever path your temp variable points to. This is important because by default the temp path points to a place on the system disk (at least for Windows), and it is quite common that that disk is not as big as the second disk in the system. So maybe you don’t want Wireshark/dumpcap to write to that place. Usually, they point to different places in the user folder and the Windows system folder, but I already changed them. 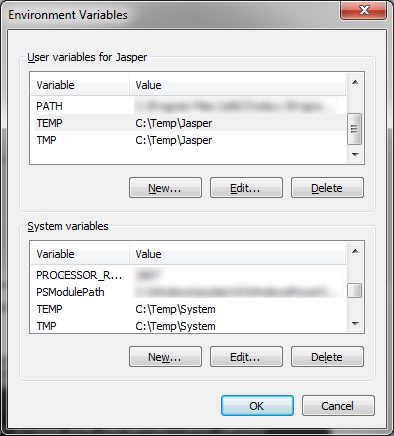 So if you want to move your temp folder, just edit the user variables (the ones in the list at the top of the window) and you’re done. It’s a good idea to clean up/move the old folder contents to the new one. Some of the files in the old folder may not be accessible because they’re currently locked. This may sound a bit funny, because the temp path is already used for temporary files, but how about having a temporary temp path for temporary files? This is often helpful if you don’t want to change your temp path for all temporary files, because Windows is using that path, too. E.g. when your system disk is a fast SSD, but it’s small and does not have room for large captures, but you still want to store the usually small temp files there? 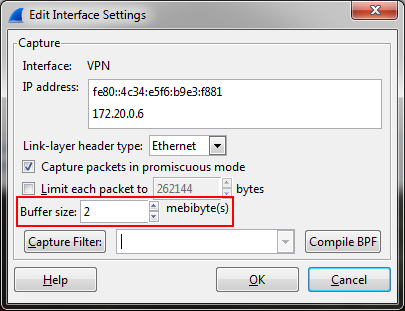 How can you make sure Wireshark/dumpcap store their temporary files somewhere else? Of course you’ll have to adjust the temporary path values as well as the directory where the Wireshark executable is located. Keep in mind that that setting is for the active user, so if you run any captures from task scheduler you need to make sure that the user owning the task has the correct setting. If Wireshark crashed during capture you can still salvage/recover the temporary capture file, if you know where your temporary path points to (if you don’t, run a command line and use the “set” command to get a list of all settings). Just look for the latest pcap/pcapng file in that directory and you should be able to copy the file to a better location, using a name of your choice. Great article. Any idea on how to force dumpcap to create the directory before it writes in it? 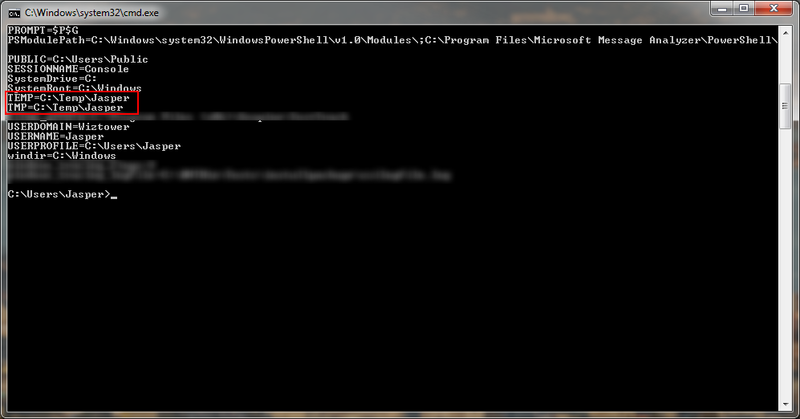 I am trying to capture packets for a few months, and have a batch file that writes based on the year/month/day/hour, but unfortunately dumpcap doesn’t try and create the directory if it is not there. I don’t think that that kind of functionality has been coded into dumpcap. You’ll probably have to code that functionality into your batch somehow, but I have to admit I never tried that myself before. So, if we put | %time:~0,2% | (without lines) into a batch script, it will output the current hour.